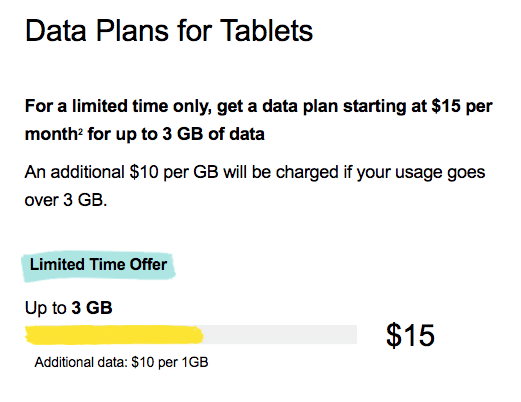 Fido has brought back a promo today for tablet users, as the $15 plan with 3GB of data returns (save $10 per month), with overages charged at $10 per GB. The regular flex data plan starts at $10 per month for 150MB, $20 per month for up to 1GB and $40 per month for up to 5GB of data. So at $15 for 3GB, this is great deal. When this promo also appeared back in August, the flex data for up to 5GB was $35 per month. Looks like Fido has bumped it up to $40 per month for 5GB. Let us know if you’re going to jump on this. Many people use these data-only plans with VoIP apps like Fongo. Update Nov. 6: the promo is live on Fido’s promo page, so go get it.